Lebanese Forces leader Samir Geagea on Wednesday blasted Free Patriotic Movement leader MP Michel Aoun for accusing him of lying over the issue of the electoral law. 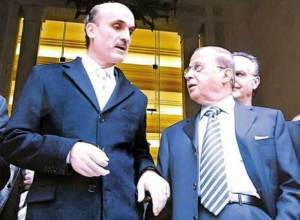 “Aoun is the last person in the Lebanese Republic to accuse anyone about lying,” Geagea said during an interview with Voice of Lebanon radio station. “Why did Aoun approve the cabinet’s electoral law if he says he supports the Orthodox proposal on an electoral law?” Geagea also asked. Geagea’s remarks come after Aoun accused him ( Geagea) of saying that he he would convince his allies to adopt the Orthodox proposal, but neglected to do so. Beirut 2, south Lebanon 2, Bekaa 3, north Lebanon 3 , Mount Lebanon 3. The new electoral law was approved by the majority of ministers, including the FPM ministers . The ministers that represent Progressive Socialist Party leader MP Walid Jumblatt’s bloc voted against it. The draft law was referred to the parliament. MP Alain Aoun along with FPM MP Neemtallah Abi Nasr also submitted another draft electoral law to the parliament . This is the so called “Greek Orthodox gathering proposal” which calls on each sect in Lebanon to vote only for its candidate in the elections based on proportional representation and one electoral district for the whole country . Jumblatt and his PSP MPs favor the current 1960 electoral law, and it appears that in the absence of an agreement on a new electoral law it appears to be the one that will be used in 2013 elections.